As one of the largest providers of recycled wood pallets and pallet recycling services in the country, Millwood sorts over 45 million used pallets each year. Our facilities, located across the United States, feature highly-automated sort and repair lines that provide for consistent and repeatable quality that you can trust in your search to find recycled pallets. State of the art production capabilities allow us to strictly adhere to industry specifications for used wood pallets. 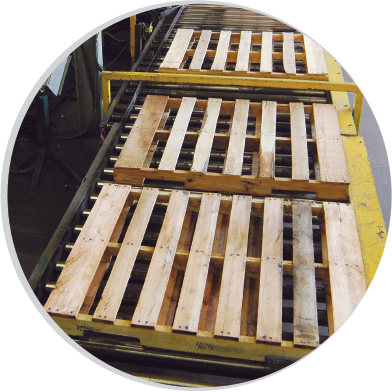 Millwood offers recycled pallets in a variety of common and custom sizes to meet every need. Truckload quantities of the most common sizes and grades are available for immediate shipment or pickup at many locations. Grade 1A GMA – A clean pallet that has been used only a few times. There is little if any repairs to the pallet. The pallet will have no mending plates or companion stringers. Grade 1 GMA – A clean pallet that may have mending plates but no companion stringers. Grade 2 GMA – This is a pallet that has had stringer damage that has been repaired by attaching a companion stringer (plug) alongside the damaged one. The standard Class 2 pallet generally has repaired stringers. The deckboard configuration is not always consistent since the pallet has been repaired several times.